Looking for the perfect red bow tie to wear with your Halloween costume? The Red Bow Tie For Adults is red hot! 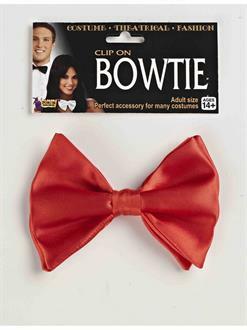 When you wear this red clip-on bow tie, you can be an entertaining party clown, run Hell as the devil, make magic as a magician, or have a big adventure as Pee-wee Herman. Care Instruction: Spot Clean Only. Line Dry. Do Not Bleach. Do Not Iron.